➡ View the complete range of Offshore Marine Cables – this includes NEK 606 standard BFOU and RFOU cable types manufactured by Prysmian Draka. T&D distribute Offshore Cables to provide LV, MV & HV power, control, instrumentation and signalling for use in the oil and gas, marine and shipping industries which are compliant with NEK 606 series standards. NEK 606 is an internationally accepted cable standard for offshore and marine cables based on the Norwegian industry and technical specifications for low, medium and high voltage power, instrumentation and control type cables. NEK 606 cables are manufactured to withstand the harsh and hazardous area operating conditions of the global oil and gas industry – conductor, insulation, screen, braid armour, bedding and cable jacket or sheathing compounds are specified to pass stringent test methods for offshore use. NEK 606 additionally covers test methods for hydrocarbon (HC), fire resistant cables and Jet Fire (JF) resistant cables and further stipulates requirements for oil and mud resistance for installation on mobile and fixed offshore installations. Originally published in 1993 by the Norwegian Electrotechnical Committee (NEK), today the NEK 606 cable standard has evolved to secure international acceptance for offshore power, control and lighting applications. 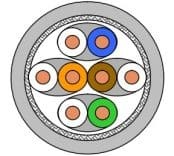 Contact us for NEK 606 halogen free, mud resistant, fire resistant and hydrocarbon resistant cables, including BFOU and RFOU types. T&D supply from stock UK and international projects with competitively priced offshore marine cables and a full range of cable accessories, such as cable joints, glands and cleats from leading manufacturers including CMP, Ellis Patents and 3M. 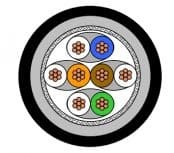 All LV, MV & HV offshore cable accessories are specified and manufactured to protect the circuit integrity of NEK 606, BFOU and RFOU cables including hydrocarbon, fire resistant and zero halogen properties. We can provide a complete single-source project supply for all Offshore Marine Cable & Cable Accessory requirements.